According to speculation in the Middle East, part of the world’s largest indoor theme park, IMG Worlds of Adventure, in Dubai, may be sold off. The reports in the regional press suggest that IMG (short for Ilyas & Mustafa Galadari Group), is thinking about selling part of all of the park. This follows IMG’s reported difficulties in restructuring an AED1.2bn (€298m US$327m)) loan. It is understood that discussions are at an early stage and it may be that the owners may decide to either make a public offering or just keep it. 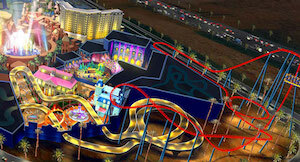 The park is only one of a number that have opened in the UAE recently. Warner Brothers has its park in Abu Dhabi and Legoland has also opened, but both have faced lower-than-expected numbers of visitors. The proposed Six Flags theme park has been stalled because DXB Entertainments has not found the finance to get it supported.